213/313 Vertical Pectoral Press This chest press movement is also available in both an elementary unit or for slightly older children as the junior model (wider grips higher resistance levels). The upright design provides for back support and comfort. Front foot platforms position children correctly while exercising. . Protective covering on cylinders ensures the safety of all users. Elementary model is powder coated in Fire Red while the junior sized model is powder coated in a deep brilliant Purple. Portable wheel system makes it easy for instructors to store units and/or reconfigure fitness circuits. Call 1-800-875-9145 to speak with one of our fitness advisors with any questions you may have. 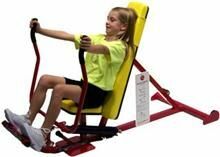 Go to FitnessZone.com today to order the Vertical Pectoral Press 213 Elem. 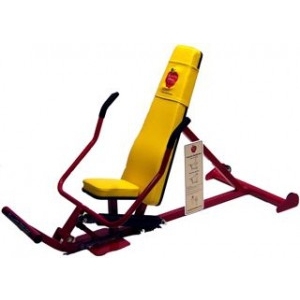 Order your Vertical Pectoral Press 213 Elem from FitnessZone.com today!